Buying a Tesla Model S just became a lot easier with an announcement on Tuesday of a financing program that combines aspects of car leasing with aspects of normal car loans. The bottom line is that under the program, someone can get themselves into a Model S with no money down, and a net out-of-pocket cost of $5-600 per month. The goal is to make the Model S more affordable, available to a wider range of customers, but, as in many things, there are a lot of details to consider. Last week Tesla's CEO Elon Musk posted one of his famous obtuse tweets announcing a big announcement, slated for last Thursday but moved to Tuesday, and that he promised to put his money where his mouth is, in a major way. What that means is that Elon Musk will personally, with his own personal fortune, back up Tesla Motors in guaranteeing the residual value for the Model S after 3 years. But let's start with the lease/financing offer. Part of Tesla's mode of operation is to eschew business-as-usual and invent new business practices that Tesla's management claim make more sense. This deal being offered by Tesla is a case in point. Under the new financing program, the purchaser puts no money down and then makes a monthly payment which acts like a lease payment. After three years the purchaser has the right to put the car back to Tesla Motors with a guaranteed minimum residual value (43%) that exactly matches the residual value for a Mercedes S Class. The purchaser has the option to simply keep the car, continue making payments, and after five years they'll own the Model S outright. If they put the car back to Tesla, they can get another Model S, or Model X, or walk away, that's up to them. Where Elon Musks' money gets stuffed into his mouth is that he, personally, will back up the residual value guarantee. Musk acknowledged there are a lot of Tesla Motors doubters, spreading the idea that Tesla is about to go belly up. By putting his personal net worth behind the guarantee Musk is saying that, even if the worst happens to Tesla, the Model S residual value guarantee will stand. Technically, the deal is not a lease arrangement, despite it having terms similar to a lease. Instead it is a car financing deal, with the right to return the car to Tesla as if it were a lease. The deal is a bit more complex than what was just outlined. First, the purchaser does have to front the $7,500 they'll eventually recoup from the federal tax incentive for electric car purchases. Second, the financing payment is quite a bit more than $5-600 per month, while the out-of-pocket cost gets to that level due to electric car cost of ownership savings. The Tesla website now has a "True Cost of Ownership" that shows how the program works. 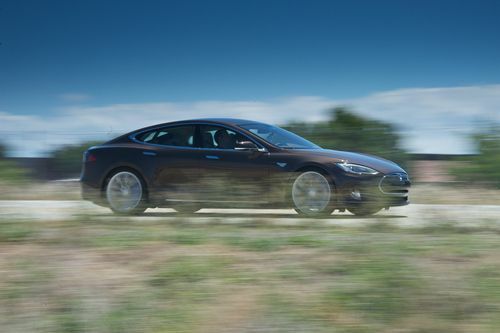 The monthly payment for the 60 kWh Model S is $1,051 per month, and for the 85 kWh model it is $1,199 per month. The monthly payment is reduced by: applying tax credits to purchase price; replacing the cost for gasoline with cost for electricity; business tax benefits if the Model S is bought for business purposes; the value of the commuting time saved because most states allow electric cars to be driven solo in the high occupancy lane; the value of time saved from not having to visit gasoline stations. A large chunk of the savings come from business tax benefits, which should make this option more attractive to business owners. During a conference call to explain the financing deal, Elon Musk described it as a compelling financing solution for the Model S, that improves affordability, grants peace of mind from knowing the cost of ownership, and the convenience factor of having the option of just giving the car back to Tesla. Tesla worked out this deal in collaboration with Wells Fargo and US Bank. The deal, as outlined, applies to purchasers in the U.S. and similar programs will be rolled out to Canada, Europe and Asia as Tesla begins shipping cars to those regions.